I screamed loud enough to be heard on the far side of the house. Then I cried. My reaction to the email from Otto Penzler notifying me that my story “Smoked” had been selected for inclusion in The Best American Mystery Stories 2018 was not the reaction I would have anticipated had I ever thought inclusion was a real possibility. I screamed across the house for my wife, and, by the time she arrived in my office, I was crying. All I could do was point at the computer screen and let Temple read the email herself. I’ve had many reactions to acceptances and publications, but crying has never been one of them. 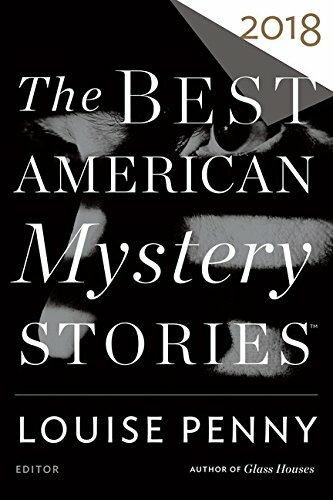 Having a story selected for The Best American Mystery Stories is a dream that began when I read The Best American Mystery Stories 1998, the second edition of the now long-running series, and I own and have read every edition since. As an editor, two stories I first published made the 2002 “Other Distinguished Mystery Stories” list (“The Horrible, Senseless Murders of Two Elderly Women” by Michael Collins and “Teed Off” by Mark Troy, Fedora), and one of my stories made the 2005 list of “Other Distinguished Mystery Stories” (“Dreams Unborn,” Small Crimes). But actual publication in the anthology? I never thought it was a possibility. Each time my wife and I visit her family, we spend much of the three-hour drive brainstorming story ideas while Temple notes them on a legal pad. Shortly before one such trip, I read the submission call for Level Best Books’ Noir at the Salad Bar, which sought stories that featured “food or drink, restaurants, bars or the culinary arts,” and during that trip my wife filled two handwritten pages with every food-related story idea we could imagine. By the time we arrived at her family’s home, I knew the story’s setting and primary characters. While Temple visited with family, I filled several more pages of the legal pad with notes, and I created a rough outline. But after inspiration comes perspiration, and the story required several drafts before becoming “Smoked,” the story of an ex-biker in the Witness Security Program after turning state’s evidence against his former gang members. Relocated to a small Texas town, Beau James has opened Quarryville Smokehouse. Then his cover is blown when a magazine food critic names his smokehouse the “best-kept secret in West Texas” and his photo accompanies the review. My wife insists “Smoked” is one of my best stories (and believes it would make an excellent movie for Amazon or Netflix! ), but she’s obviously biased, and I learned long ago never to trust my own judgment. So, I had no reason to think “Smoked” had any more of a chance to be selected than any of the many other stories I’ve sent Penzler over the years. That I was emotionally overwhelmed when Penzler’s email popped up in my inbox is an understatement. Perhaps I should be embarrassed to admit it, but I’m not: I cried with joy. In addition to “Smoked” in The Best American Mystery Stories 2018, my story “Texas Hot Flash” appears in the first print edition of Tough and my story “Mr. Sugarman Visits the Bookmobile” appears in Shhh...Murder! It is an exciting volume to be part of! Congratulations! I've already ordered my copy of the latest Best American Mystery Stories--gonna need you to sign it next time we're together! And thrilled with having so many other friends in the collection as well, including David Gates, John Floyd, Paul Marks, and Alan Orloff--such a terrific group of writers, hooray! Way to go, Michael. Keep 'em coming. Congratulations, Michael! And what great company you're in. It waa a great story, Michael. I got That Penzler Moment a few years ago and will never forget it. Congrats! Dude, you are a MACHINE! What a thrill that would be. And well-deserved by you. This is great news, Michael, and way overdue in my opinion. G'head, cry all you want to. Thanks for all y'all's kind comments. After writing today's blog, I ordered a used copy of the first The Best American Mystery Stories. Once the new one arrives, I will have a complete collection of BAMS, and during the next few months I will read them both. A well deserved honor, Michael—and what a great reason for a guy to cry! Good for you! Congrats, Michael!!!!!! Can't wait to read it!!! Congratulations! Who wouldn't cry, jump for joy, fall over in a faint? Well deserved, and I can't wait to read the story. Congratulations, Michael! Yep, getting that note from Otto is quite a thrill. Wonderful news, Michael! Congratulations! Janice C.